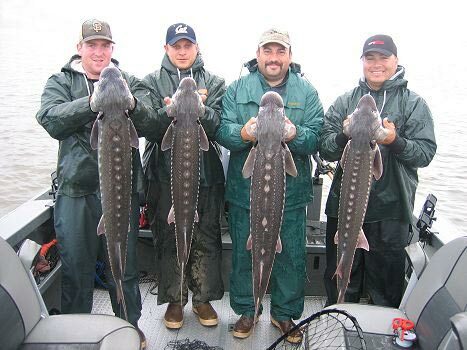 Sturgeon fishing with pro Columbia River sturgeon fishing guides Kevin Newell & Lacey DeWeert! Catch the largest species of freshwater fish in North America! Sturgeon fight hard! They run line off of the reel and jump, coming completely out of the water! These are definitely the strongest freshwater fish in the NW. Sturgeon fishing trips are very productive. It's common for us to catch 15 to 30 sturgeon per day or more! 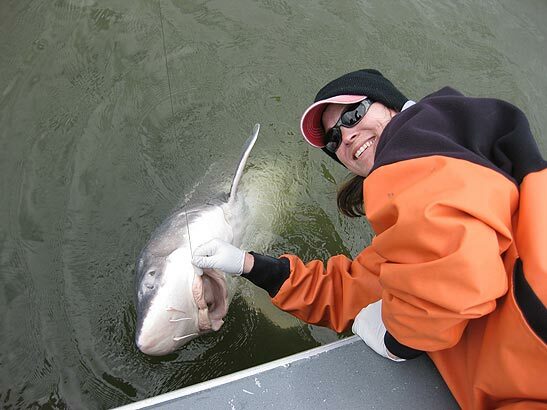 Keeper sturgeon average 47 to 55 inches in length and oversize fish over 5 feet happen all the time! Sturgeon are easy to cook. They are boneless with sizable fillets and they taste great! 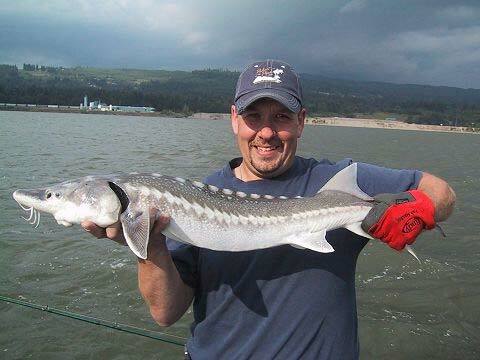 Sturgeon fishing near Astoria, Oregon! Battling a ten foot sturgeon near Bonneville Dam! Pro Sturgeon Fishing Guide Lacey DeWeert with a BIG oversize sturgeon! 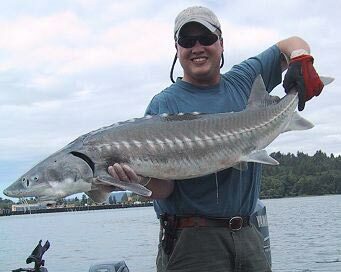 Sturgeon fishing on the Columbia River is hands down one of the greatest freshwater fishing experiences in the world! 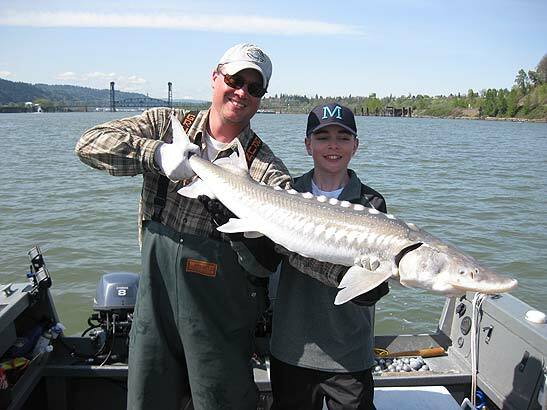 Anglers come from all over the nation and from all over the world to catch the Columbia River's White Sturgeon! 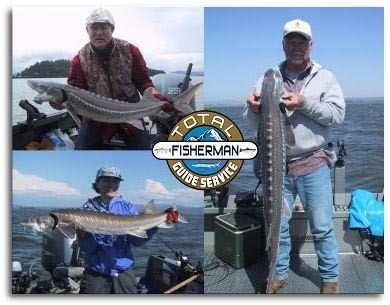 Having a great day of sturgeon catching goes hand in hand with having a great fishing guide who is knowledgeable about the fishery and is motivated to work hard to get you into the sturgeon and to keep you there. Knowing with a guide that knows sturgeon's behavioral patterns is a must if you want to have the best day possible. Keeper sturgeon landed on the Columbia near Astoria Oregon! Master sturgeon fisherman Troy Schmidt with a 2-3 year old White Sturgeon. "Shakers" are sturgeon that are less than 44" (measured to the fork of the tail) in length. As you can see from the picture, even sub-legal or sturgeon that are "too short" are still big and definitely put up a good fight. 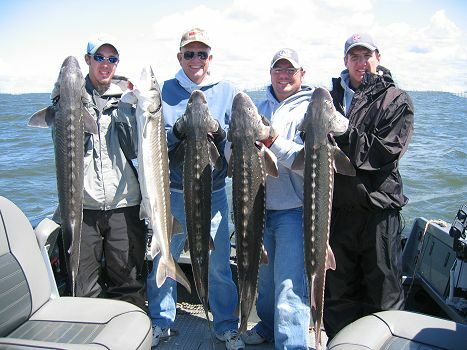 Catching a large number of fish in this size range, plus keepers and oversize sturgeon is what makes a sturgeon fishing trip such a great experience! Six keepers caught in the Columbia River estuary near Astoria! "Keeper" sturgeon are fish that measure 44" - 50" from the fork of the tail to the tip of their nose. A 44 inch fish is going to weigh approximately 32 pounds and 50 inch fish can weigh over 42 pounds! Your sturgeon are all going to be filleted, but make sure you bring a big cooler because four to six filleted out sturgeon provide a lot of meat! 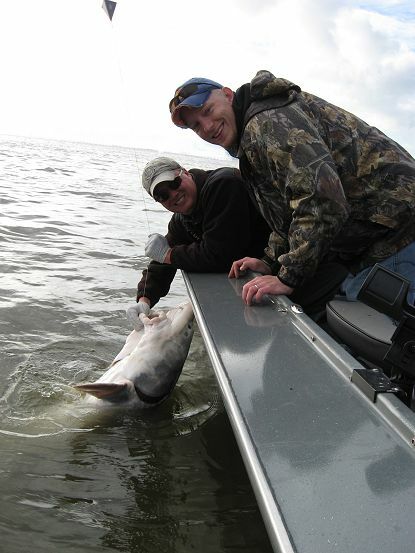 A seven to eight foot sturgeon caught on the lower Columbia! Sturgeon measuring over five feet in length are truly giant fish! These fish can weigh over 1000 pounds and attain lengths over twenty feet! 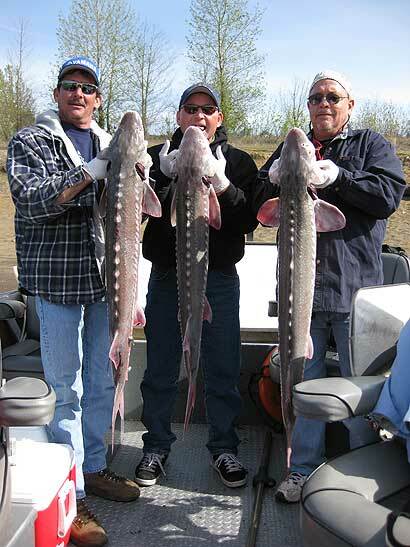 These huge fish are called "oversize sturgeon" because they are longer than the length you are allowed to keep. When you are battling one of these bruisers you're going to know it! Oversize average 5 to 10 feet in length with an occasional fishing being larger than this. Hooking one of these beasts and seeing them jump and completely clear the water is an amazing site, enjoy it ... because your in for a 20 to 60 minute battle of wills that will test the endurance of the most seasoned angler! 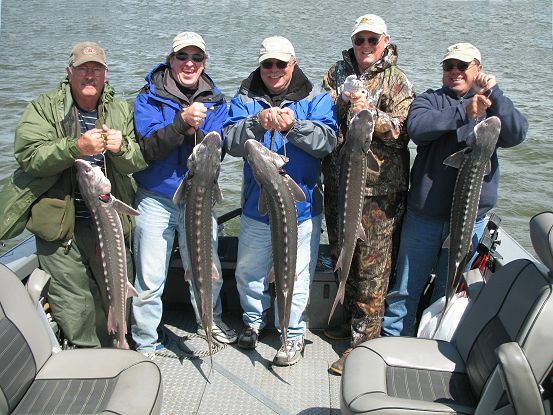 Happy sturgeon fishermen from Vernal, Utah; with a nice haul of keepers! 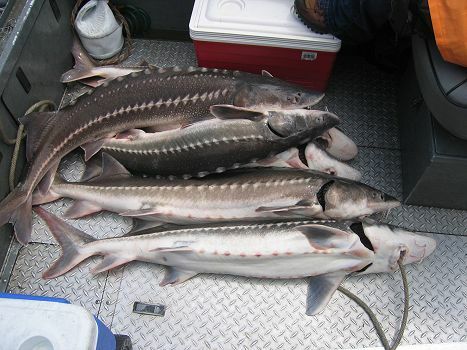 White Sturgeon can be caught throughout the year and our catch and release sturgeon fishing is really incredible. However if you want to keep a sturgeon, then there are specific seasons and locations that we fish for them. Willamette River Sturgeon fishing! These three keepers couldn't stay away from our really high quality smelt! January, February and March is the beginning of our sturgeon season and during this time you will find us on the Willamette River in Portland, Oregon. This is a fantastic fishery with one of the highest catch rates of the year. 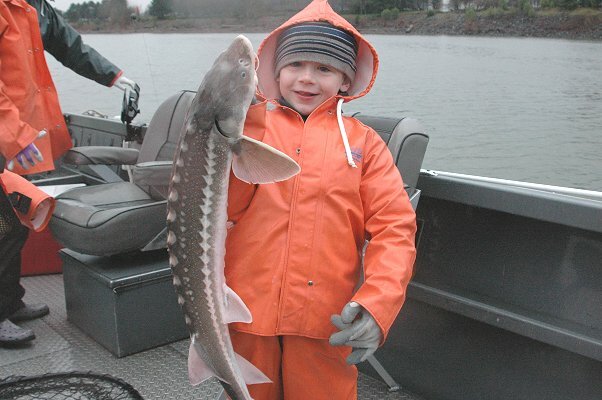 Kevin and a happy customer with a really nice keeper sturgeon caught on the Willamette River! April - May is when the Columbia Rivers' temperature begins to rise and the sturgeon leave the Willamette to migrate downstream to Astoria to meet the arrival of the huge schools of achovy and shad that are going to enter the river in late spring and summer. We know the perfect locations to intercept them when they are making this migration. Kevin with a 54" sturgeon caught in the Columbia River estuary in eight feet of water! 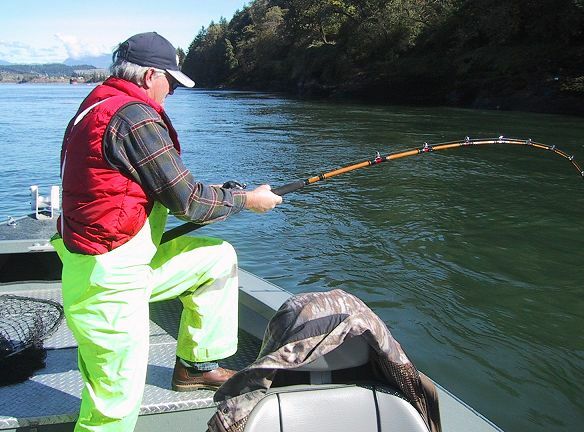 May, June & July is when it's time to head to the lower Columbia River near Astoria, Oregon to catch the huge numbers of White Sturgeon that come in from the ocean to feed on the abundance of food that spends the summer in the Columbia River Estuary. Fishing in the estuaries shallow tidal flats and catching HOT sturgeon in 6 to 8 feet of water on light tackle is a blast! We use anchovies and sand shrimp for our sturgeon bait during this time and these fish just jump all over it! Large numbers of keeper sized fish, an average of five to ten+ oversize fish a day, great weather and beautiful surroundings make this a very popular trip.